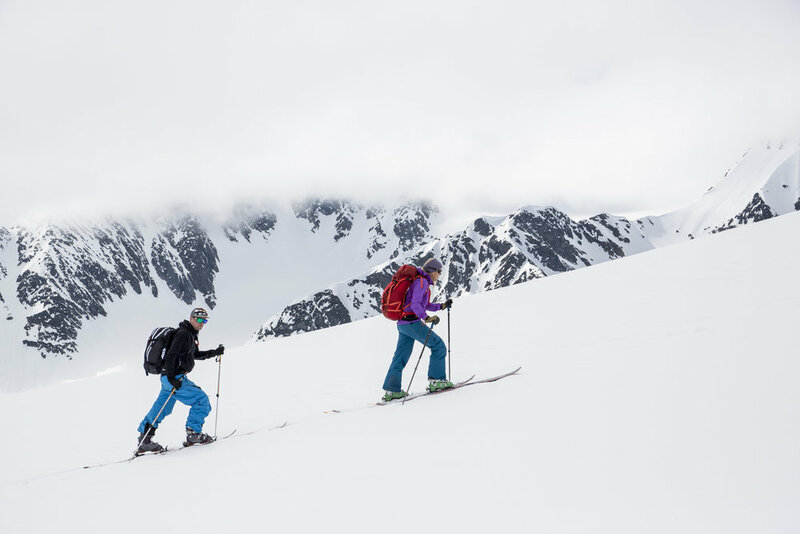 Ski touring in Lofoten is like no other ski vacation. The contrast of the calm ocean with rugged peaks raising straight from the sea, makes this a unique setting for ski touring. The mountains are up to 1000m high and offer a variety of terrain from steep couloirs to wide open bowls. March is the prime time to ski in Lofoten when winter is transitioning to spring with sunshine one minute and snow storm the next. The sun sits low on the horizon all day long, with views of the ocean all directions. This is also a good time to watch the northern lights. We will be based out of a traditional but beautifully renovated fisherman’s cabin right on the shore and spend each day touring the region on skis. 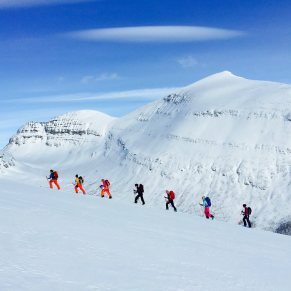 The great road-system along the coastlines offers lots of options for where to start our ski days, and every day we will drive to different locations along the ocean front and climb the surrounding mountains. This is a unique ski tour in an idyllic setting. Tune in to all the beauty of the arctic: the northern lights, the pristine alpine and the fjords. This ski retreat takes place at 68°N in the beautiful and wild Lofoten islands, Norway. 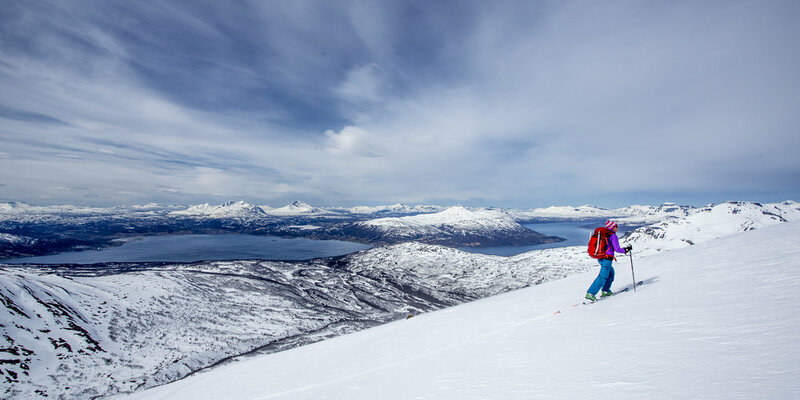 Get fully immersed with the Norwegian landscape and culture, where mountains meet the ocean just above the arctic circle. Late afternoon pick-up at Svolvaer airport, Lofoten Islands. A short drive to our cabin in Svolvaer for a meet and great. Welcome dinner is served and we go over the week’s agenda. We will spend some time in the evening for a detailed avalanche safety and rescue training, to maximize our following ski days. This is our first day of skiing, we will spend some time for avalanche safety and rescue training, followed by our first of many peaks. Our average daily vertical ranges from 1000-2000m, depending on the group and conditions. For those that want more we can go until your legs say stop: lack of daylight is not a threat up here this time of year. 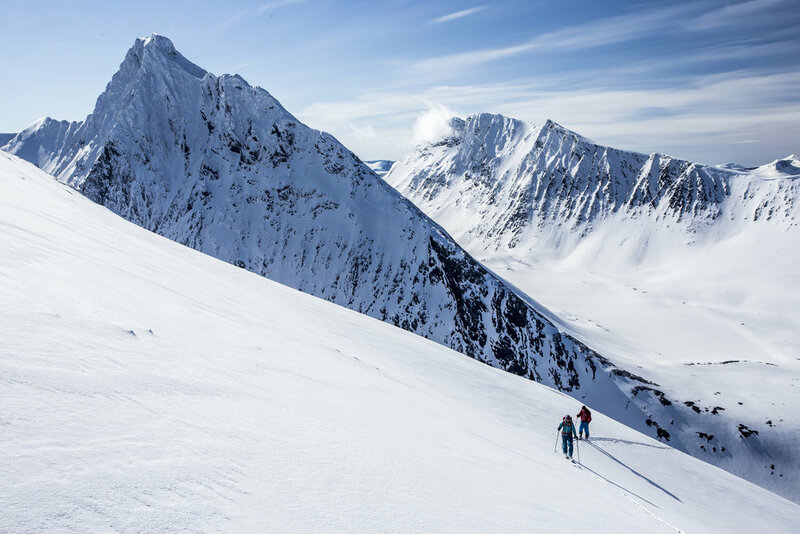 Ski locations are accessed by a short drive from our base in Svolvaer (anywhere from 10-45min drive to our chosen location). 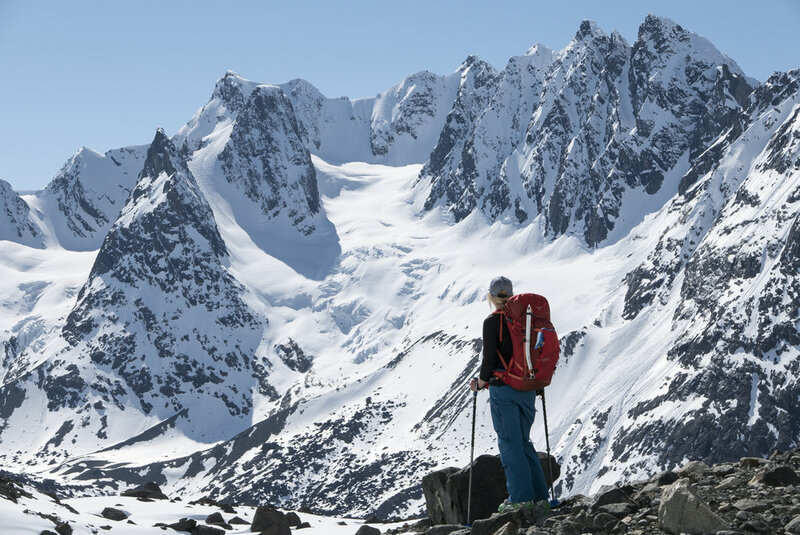 Throughout the week we take the opportunity to visit new places, giving you the grand tour of the incredible backyard of snow covered peaks, all without losing sight of the ocean below. Located at 68° North, Lofoten Islands have a great combination of long days and cold arctic powder in March. The sun sitting low on the horizon, giving you the feeling of skiing under sunrise and sunset all day long; the lightning of a photographers dream! You can experience a mix of weather, changing rapidly from snow storm to sunshine. The mountains are up to 1000m high and offer a vide variety of terrain from steep couloirs to big open bowls. 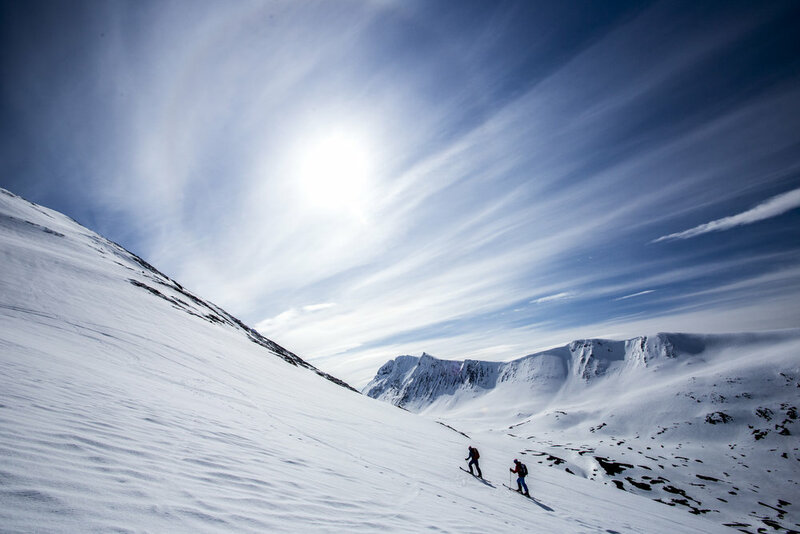 This trip is designed for people with some ski touring experience. 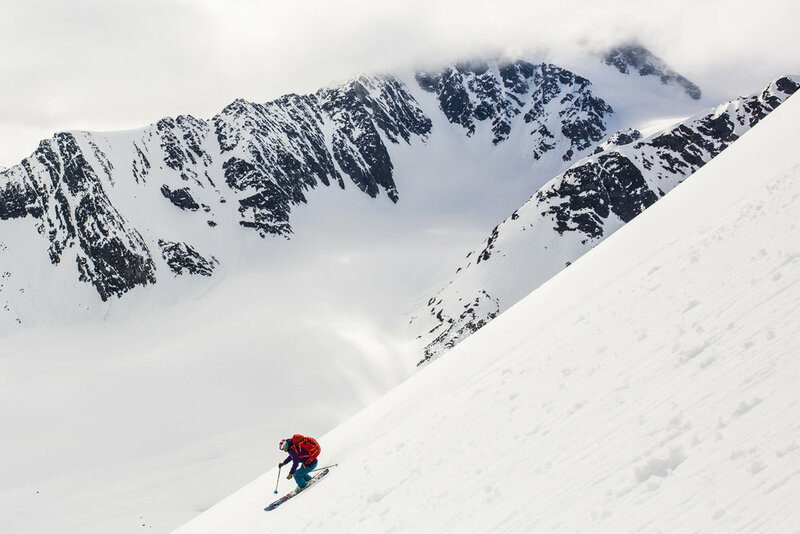 You should be comfortable skiing blue (intermediate) and black (advanced, expert) ski runs and have a good level of fitness (ability to walk uphill for 2- 4 hours), with basic backcountry experience. Transportation during the trip, including pickup and drop-off at the airport at the start and finish of the trip.